Print your menu on the mugs and place it on your tables. Now it can be used as a menu card. Clear cello bags available for mugs. Put the mugs in a cello bag tie it with a ribbon and you will have a beautiful and easy favor. The cello bag will also reflects light making your reception tables sparkle with romance. 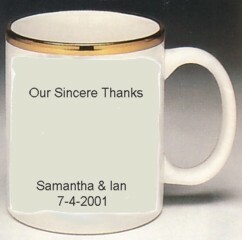 Each item can be imprinted with names, date, message and your choice of wedding or heart designs. Great if filled with tea, coffee or candy.